As dusk turns to night and the Kwai Noi river changes its mood, the cool evening wind reverberates the magical sounds of Mon music and their Balinese-like dance. Time drags on as the river moves. Our host tells folklor stories of the river over the wooden table under the candle light. The Jungle Rafts provide food which is as good for the body as the atmosphere is for the mind and spirit. You can select Thai or Western cuisine for the evening and begin the day with a hearty American Breakfast. Rooms are sold either halfboard (American breakfast + European dinner) basic or fullboard (American breakfast + Thai lunch + European dinner) basic. Boats for transport between resotel pier (see the map below) and Jungle Rafts are available for a fee. Your approximate arrival time at the Resotel pier should be informed beforehand. 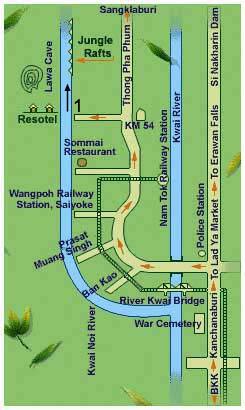 Located on the bank of the river Kwai Noi in Saiyoke district, Kanchanaburi province, 200 kilometers from Bangkok. By car drive along route no. 323 (Bangkok - Kanchanaburi - Sai Yoke - Thong Pha Phum). Turn left at km. marker 54 for another 2 km. drive to Resotel parking lot and boat pier to take a boat to the Jungle Rafts. By bus take a bus at Bangkok's southern bus terminal to Kanchanaburi town. Then change to Thong Pha Phum bus and get off at km. marker 54.